Soft, fluffy, and tender sweet orange rolls with warm cinnamon, melty dark chocolate, crunchy pistachios, and cardamom. Serve these sweet babies warm, and smothered in generous dollop of icing seeping between all of the layers and down the sides. That is how you should enjoy a roll. The yeasty smell of homemade cinnamon rolls sends me back to 4th grade, the year my mom started making various versions of cinnamon rolls; just about every weekend. She experimented with every recipe she could get her hands on. One recipe in particular was labeled "Cinnabon Copy Cat," to which I protested her ever making those. I found the whole signature middle of a Cinnabon to always be a unbaked disgusting glob of yeast. Why would someone like my mom want to mimic that, did she want me to die from salmonella? Because I would happily eat a bowl of cake batter, or raw cookie dough in exchange for an unbaked pretend Cinnabon! I'll take my salmonella chances that way any day. So many friends growing up loved the center, they craved that unbaked middle, but not me, no way Jose! Thankfully, my mom was brilliant and heard my pleas, she baked the rolls all the way through, and I ate a good portion of these fluffy cinnamon-laced bons dripping of sweet cream cheese glaze fresh from the pan and over the kitchen sink. No napkins or plates needed when you have a faucet of running water and a dish towel. And, although I still prefer to eat over the kitchen sink when I don't want to dirty up a plate, or waste a paper towel, I do think these regal rolls deserve a nice sit down with a freshly-made hot cup of coffee or tea. Leave the fork and knife in the drawer. These rolls deserve every digit and thumb. I should warn you. You will have the urge to unroll and break off layers, and I whole-heartily encourage that. These rolls are jam-packed with and beg to be cracked open like a geode. Pick a hot roll up straight from the pan, unravel, and dunk a broken layer into more orange glaze. I know. I love to get fancy. Please tell me: am I the only one that prefers a cooked-through roll or was the unbaked center the best part of a Cinnabon? Dough and filling adaption from Joy the Baker's Bonkers Awesome Pistachio Orange and Dark Chocolate Cinnamon Rolls. Orange Glaze and additional filling adaption from Pioneer Woman's Orange Marmalade Rolls. For the dough, heat the milk, oil, and sugar in a large saucepan over medium heat to just below a boil. about 105 degrees F. Sprinkle the yeast on top and let it sit on the milk for 1 minute. Add 4 cups of the flour directly to the saucepan. Stir until just combined, then cover with the lid to the pan, set aside in a warm spot for 1 hour. I will leave on or near the stove if it's in a sunny spot and still warm, or if your home has come equipped with a bathroom warm bulb, that will do the trick. Or, if it is a warm day, I have been known to leave the dough to rise in my car parked in the street. Check the dough after 30 minutes to ensure it is rising well. After 1 hour, remove the lid an add the baking powder, baking soda, salt, and remaining 1/2 cup of flour. Stir thoroughly to combine. At this point, you may use the dough right away or cover and refrigerate to use the next morning. Preheat oven to 375 degrees Fahrenheit with the racked placed in the upper third and center of the oven. Grease 2 pie tins or 2 8x8-inch square baking pans. set aside. To assemble the rolls, remove half of the dough from the pan/bowl onto a floured surface. Roll the dough into a rectangle, about 12 x 8-inches. The dough should be rolled fairly thin. -since we are using half of the dough, remember to halve the toppings-. Spread half of the orange marmalade over the surface of the dough. Pour half of the melted butter over that and sprinkle generously with half of the sugar, half of the cinnamon, half of the cardamom, and half of the chocolate and pistachios. last, sprinkle with salt. Beginning at the long side farthest from you, roll the dough tightly towards you, finishing with the seam side down. At this point, you may cover and refrigerate the rolls to bake tomorrow (they will slice easier once firmed from a long nap in the fridge). or you make bake directly, just remember to turn off the oven if hanging on for another day. Slice the dough into 8 equal slices and arrange in one of the prepared pans. set aside and repeat the process with the remaining half of the dough. Allow sliced rolls to rest for 15 minutes. Place into heated oven and bake for 20 to 25 minutes, or until the rolls are bubbling and golden brown. While the rolls are baking assemble the glaze. Whisk together the glaze ingredients being cautious with the addition of the liquids. I prefer a thick glaze so I add until I hit my preferred consistency. Mixture should still be pourable. Immediately drizzle orange glaze over the top of warm slightly-cooled rolls and enjoy! And, always, always serve these babies warm with a generous dollop of icing, seeping down the sides and into all of the layers. That is how you should eat a roll. A few months ago I clipped out the recipe for Oui Presse's Espresso Coffee Cake from the Portland Monthly Magazine and can you guess what I did, I baked it. this little baking project has been my first of all baking I've done for all of 2017, yep, that includes all of summer and spring. why the lapse, perhaps the pull in all directions. full-time working mom. early morning gym sessions. blogging hobby. food events. a household to manage. weekends to spend doting on my kid. Just basically doing all the things. With that all said, I finally took some time away from the heaping loads of laundry, the endless to-do lists, and the nap I wanted to take to reacquaint myself with my oven. Taking the time to get back to the nitty-gritty of what this blog started out as, a food blog, was a wonderful feeling. The measuring of ingredients, the smell of baked goods, and finally, eating of said baked goods, it's all a part of the process and it's a process I enjoy. Let it be known I was happy to find myself back in my kitchen, I hope to mend this broken relationship, and soon. I've never visited Oui Presse but I've heard rave reviews about this quaint coffee shop nestled between Castagna, and a pet supply store. And, have you, too, heard about the chocolate chip cookies and the pb & j royale, I hear they are ones to blow your socks off. After reading the way Portland Monthly beautifully described this espresso coffee cake, I just had to make it. preheat oven to 375 degrees fahrenheit. grease or spray a 10 by 4 1/2 inch tube pan. in a stand mixer fitted with a paddle attachment, or using a handheld mixer, cream butter and sugar at medium-high speed just until combined; about 1-2 minutes. add eggs and vanilla, and beat until incorporated, scraping down the sides, about 60-90 seconds. remove bowl from mixer, and fold in the rest of the dry ingredients using a spatula. fold in the buttermilk and sour cream. using the mixer again, pulse on low speed 3 or 4 times, or until there's no visible flour remaining. if using a stand mixer, remove bowl. make a well in the center of the batter, pour in coffee, and fold in with a few swirls. pour batter into pre-sprayed pan. pour nuts and brown sugar in the same mixing bowl you just used to make the batter (don't clean it), and mix with the batter-covered paddle or beaters on low speed for a few seconds, or until the nuts are well coated. distrubute evenly over the cake. bake for 38 minutes, or until the topping is browned and a skewer inserted in the middle of the cake ring comes out clean. the coffee cake will keep at room temperature, wrapped, for up to three days. recipe copied from march 2017 issue of portland monthly magazine, link to direct recipe here! Hey guys! We're a few days away from the start of spring and who else can't wait? Wait a second, I can't answer that, it looks like mother nature sure can... it's looking to another week of rain for us portland folksh well. 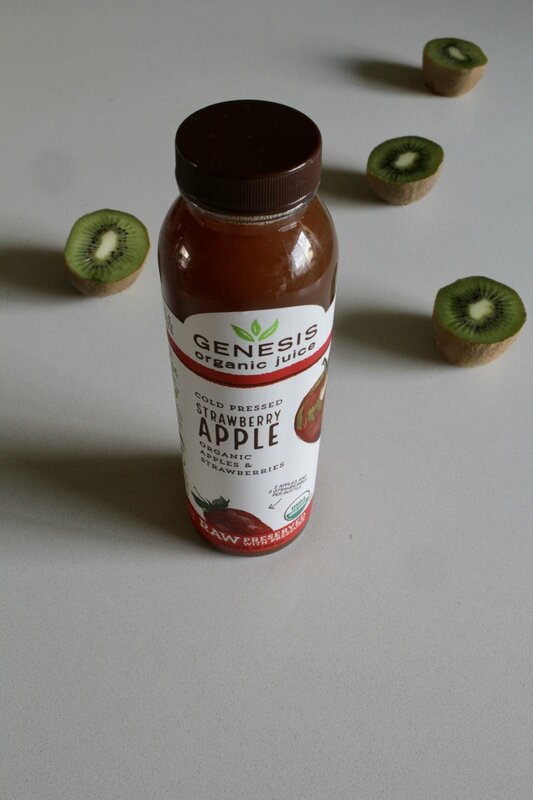 to combat some winter blues I've blended up some colorful ombré smoothies using my favorite cold pressed strawberry apple genesis organic juice. Besides looking forward to daylight savings, what are you doing to chase these winter blues? Head below to find out how to layer an ombre smoothie! First layer: Blend the Strawberry Aapple Genesis Organic Juice, 1 acai packet, ice, and 2oz coconut milk until smooth. Pour out 1/3 of your cups space and freeze for 10-15 minutes. *freezing between the layers will help to keep the layers separated while we build them, otherwise you'll wind up with the layers bleeding (yep, I totally forgot to freeze, thus my layers bled). Reserve remaining smoothie -we will start diluting this base. Second layer: To the remaining base add 2 oz of coconut milk, and 1/2 c. yogurt (or in my case 4 cubes). Blend until smooth and lump free. Pour out enough smoothie to build an additional layer on top of the beginning layer, sticking with 1/3 of the cups space. Freeze and do not rinse out your blender. Third layer: To achieve a lighter color I recommend pouring off a little of the remaining base (about 1/3 of a cup), and to that base add 4 tbsp. full-fat coconut milk. blend until smooth and pour on top of the the previously frozen base. ta-da! Add toppings and enjoy immediately! I hope yours turns out better looking than mine, because Y O U will remember to freeze between the layers! **for making smoothies i like to freeze extra yogurt in ice cube trays, by doing so i don't have to worry about expired yogurt and it works great in smoothies. 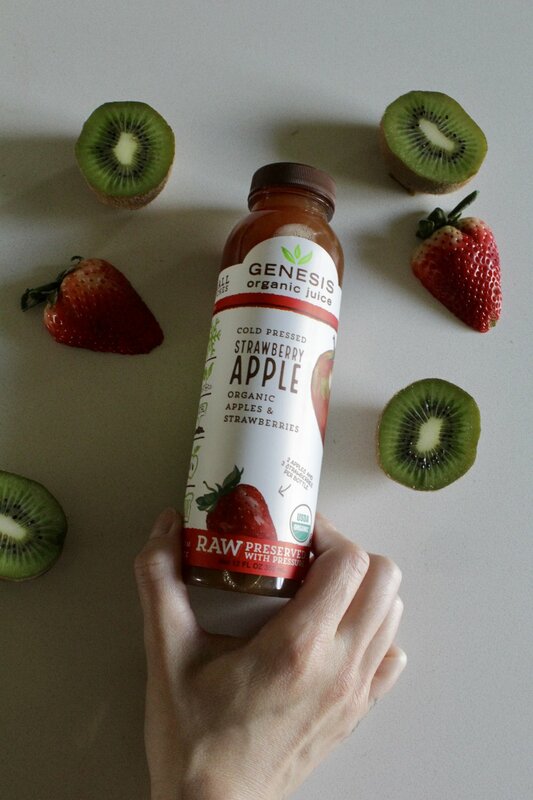 thank you GENESIS ORGANIC JUICE for sponsoring this post!